5.0 out of 5 starsYou Won't Be Bored! Claudia Must Die starts with Claudia hiding from her husband and his hired assassins. At a coffee shop, she spots a college student named Parker who looks just like her. She watches Parker and even breaks into her apartment with the goal of taking over her life. When Claudia sends a letter to her mom, postmarked with Parker's address, it's bad news for Parker. What happens throughout this story is shocking and made me wonder how anyone could do the things these characters do, which made this story interesting to read. T.B. Markinson does a great job getting us into the heads of her characters. I especially liked the assassins' perspectives because it was different. T.B. gave each character a unique past that perfectly explains why they are the way they are. She's a master at character development! There are humorous parts, gritty parts, and intense parts. This story is different from everything else I've read lately, which is a good thing! Every few pages there was a new twist that kept me thoroughly entertained. I wasn't bored for a moment. And the last page literally made my jaw drop. If you're looking to be entertained and enjoy books with assassins and murder, you'll like this one. I wish Amazon would let us give 1/2 star ratings because I'm somewhere between it's ok and i like it. This was my first book by this author. I started reading the book and didn't like it at first. Claudia was completely unsympathetic to me and I wasn't sure I cared if she died or not. In fact, I was sort of hoping she would meet a gruesome death. But the author did a decent job of developing her into a character that, if I couldn't like, I could at least understand. The other characters really save the book for me and had similar arcs - even if they weren't likable in a good guy sort of way, they were understandable. Frances was my favorite, though Parker a close second. I sort of rooted for her throughout the book, especially when she was waving the gun around. Frances I would want on my side in a fight. The plot - I'm reluctant to call it twisty. It has some interesting turns, alot of darkness, a little humor. The end was a little disappointing, though satisfactory in the overall sense of things. I felt like the author cheated us with the ending. There was no real resolution - just an ending. I didn't like the author's writing style of head-hopping points of view. There were too many times I couldn't tell who was speaking or who's head we were supposed to be in. That pulls me out of the story. When a single POV wouldn't work, or even multiple POVs wouldn't work, the author slipped into omniscient POV which is weak imo. I also think the author used the dog's POV at one point. I did finish the book so that's a plus in the author's favor. A free book or cheap book is just too easy to put aside. I would probably read something else by the author now that I know what to expect. I enjoyed this book as much as the others who've reviewed it, but my take on it is a little different than theirs. Sorry, but I didn't see it so much as a taut thriller as I did a "Fargo"-like story populated with delightfully quirky characters who are forced into a strange alliance because of a botched murder attempt. Not that someone wasn't killed, mind you. It's just that the WRONG someone was killed. Oops. A wrong someone who happens to be the cousin of a red-headed, freckled, classics-reading and karma-vs-fate-debating Irish gangster. But in the would-be assassin's defense, the person he was trying to shoot wasn't the right person, either. She just looks like Claudia, the intended target, who cleverly set her up to save her own skin. The way Claudia sees it, just because she stole a measly million bucks from her mean-as-a-snake gangster husband and took off with it doesn't mean she should let his stupid goons kill her. Especially when there's a handy Miss Nobody look-alike who can take her place. For me, this book is a real winner. The characters, plot twists, and deliciously dark humor make it a most enjoyable... and quick... read. This was quite a entertaining ride. It was super fast paced - I wouldn't go as far as calling it continuity, just didn't bother with details that weren't necessary. So if you're one that likes to know about every detail in a book (like what's on the coffee table, what TV show was playing, (how did the TV show end); then this isn't for you. But I sure enjoyed the fact that the story, was about the story and the characters and not 20 million other things! 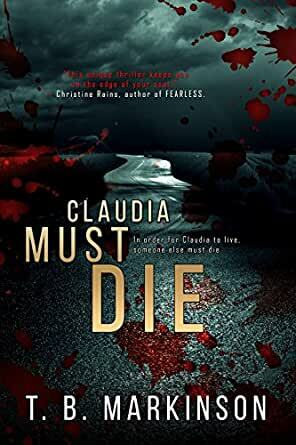 It was a quick read Whether you feel pity for Claudia or agree that she must die - I had a smile on my face before I fell out laughing out loud at around the 90% mark. I would pick up another book from this author - cause I like the quick story telling and it was a good story. Claudia James is on the run from her abusive husband. She has relocated about 7 times, is at her wit's end, desperate for a way out of this nightmare. She spots her double, a college student who looks just like her. This seems like a solution to this crazy situation, so she hatches a plan and breaks into the woman's apartment. Her husband, Dennis, has hired two assassins. They are not trained killers, but take their work seriously. He gives them ten days to find her and complete the assignment. Meanwhile, the student's girlfriend, a travelling businesswoman, returns home early. This unexpected distraction confuses the assassins. They shoot... and a woman falls. Is it the right woman? This is a fun read... dark, quirky and twisted. I enjoyed the dynamics between the well-developed characters.